In October 5th 2015 it is a celebrative date of NozzleBlack for their new development of inkjet CTS direct image system + UV exposure on the screen printing frame. This is a small step in laboratory of NozzleBlack but it is a great step for serigraphic printing industry. When first live demonstration of our CTS inkjet printer on All-In-Print 2014 Shanghai exhibition, we showed a 52x80 inch model, which can process big screen printing plate with an emulsion coated frame from which sensitive screen printers are able to smell the innovation of future screen plate making. As you may know that increasing strength of LED / UV is mainly depends on the new development of wafer, fluorescent powder and ratio of transforming from light to heat. 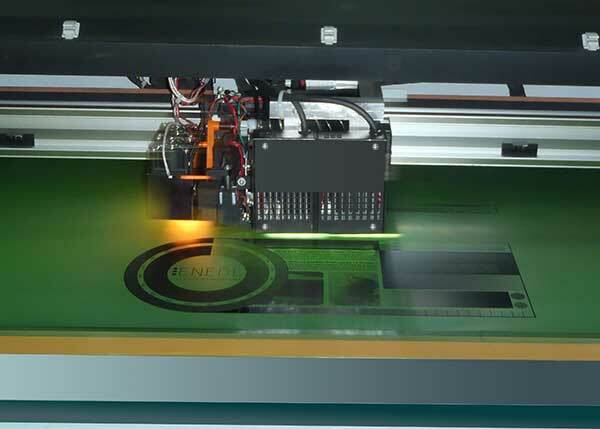 Fortunately most of these are top strong industries in Taiwan by which enable us to apply these technologies on our printer in order for inline UV exposure. Which means it is no longer to use vacuum pump for exposure any more by just print image and exposure with LED /UV inline then washout the emulsion with water. This will kick out the nightmare of screen frame exposure with vacuum pump, for most of plate making failures are during this procedure. CTS + UV inline printer now is available for sizes 42 x 60 inch (Model: 1080) & 52 x 80 inch (Model: 1320).